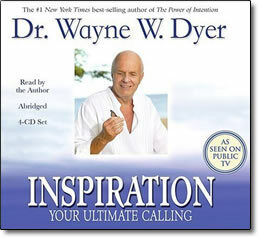 Inspiration: Your Ultimate Calling – CD by Wayne Dyer – Discount! From a very personal viewpoint, Wayne Dyer offers a blueprint through the world of spirit to inspiration, your ultimate calling. There’s a voice in the universe calling each of us to remember our purpose—our reason for being here now, in this world of impermanence. The voice whispers, shouts, and sings to us that this experience of being in form, in space and time, knowing life and death, has meaning. The voice is that of inspiration, which is within each and every one of us. In this groundbreaking work, Dr. Wayne W. Dyer explains how we’ve chosen to enter this world of particles and form. From our place of origin, in ways that we don’t readily comprehend now, we knew what we were coming here to accomplish, and we participated in setting this life process in motion. So why not think this same way? Why put the responsibility or blame on any one or any thing that’s not a part of us? On Earth we have the capacity of volition—we can choose—so let’s assume that we had the same capacity when we resided in the spiritual realm. We chose our physical body, and we chose the parents we needed for the trip. It doesn’t seem too great a stretch to move into the idea that we chose this life in concert with our Source.
. The feelings of emptiness; the idea that there must be something more; wondering, Is this all there is? and trying to determine the meaning of life . . . this is all evidence of a yearning to reconnect with our soul space. We’re aching for our calling to be felt and expressed.